If you stopped by any elementary school in Queen Anne’s County this spring during lunchtime, you might have wondered what was going on — amidst the controlled chaos of lunchtime, why did that group of 4th- and 5th-grade boys each have a book with them, and who was that grownup they were reading with? This scene was made possible by an ongoing collaboration between Queen Anne’s County Library and Queen Anne’s County Public Schools that has resulted in the Guys Read program — 2018 marked the third year of this program, which follows a model developed by the Fairbanks (AK) Public Library to engage school-aged boys at a time when average reading scores tend to precipitously drop for boys compared to girls. Guys Read aims to engage boys with funny, exciting books that might not yet be part of the school curriculum, and male volunteers from the community (“grownup guys”) read the books aloud with students during lunchtime. 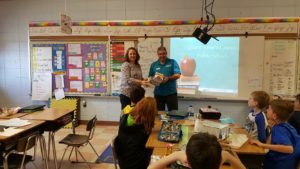 Queen Anne’s County Director John Walden distributed Friends-funded new books to students who completed the Guys Read program at Grasonville Elementary School. Research shows that many boys don’t think of reading as a masculine pastime. Many boys reach adulthood without having masculine role models who read for pleasure. It is well established that the best way to grow a reader is to read to them and for them to see their role models read. The Guys Read volunteers are intended to serve as needed male reading role models. Queen Anne’s County Library Assistant Director Kim Baklarz worked with the schools and volunteers on this program. This year 17 community volunteers worked with more than 475 4th- and 5th-graders from seven county elementary and middle schools. 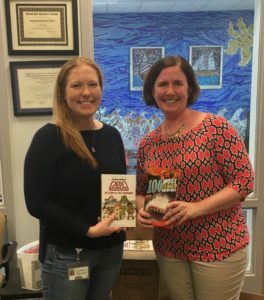 Together they read and discussed portions of four books, and students were encouraged to head to their school library and the public library to find the books, and more like them. As the program wrapped up this year, each student received a free copy of one of the books that they had discussed in order to encourage them to continue reading independently even after the conclusion of the program. The Friends of Queen Anne’s County Library provided the funding for the books. Plans are already being made for year four of Guys Read. If you are interested in serving as a community volunteer in the 2018-19 school year, contact Kim Baklarz at kim@qaclibrary.org.